One in every 100 Australians lives with schizophrenia. No single cause of schizophrenia has been identified, and this has prevented the development of a cure. Current schizophrenia treatments are designed to suppress symptoms rather than target underlying causes of the disorder, only partially relieving these symptoms and can produce unwanted side effects. 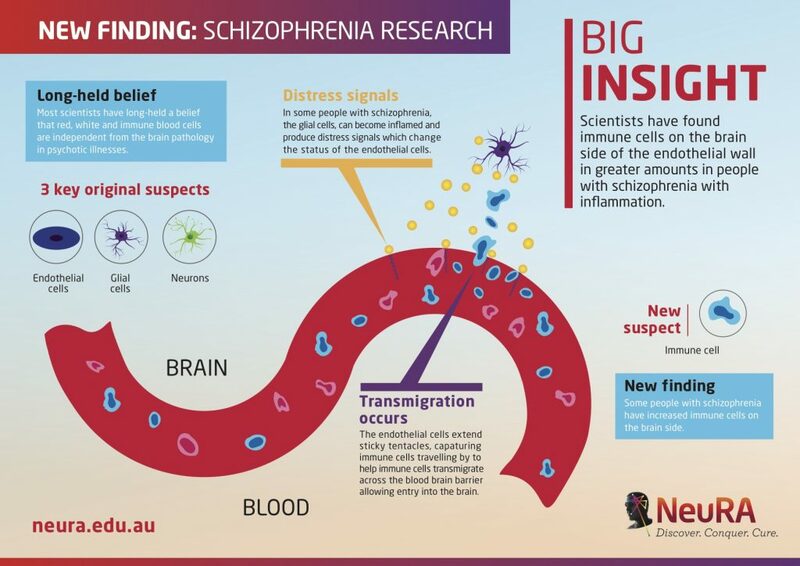 But now, in a breakthrough study from Professor Cynthia Shannon Weickert at Neuroscience Research Australia (NeuRA) immune cells have been identified in greater amounts in the brains of some people with schizophrenia. “In our study, we challenged the long held assumption that immune cells were independent of the brain in psychiatric illness and made an exciting discovery. We identified immune cells as a new player in the brain pathology of schizophrenia,” said Professor Shannon Weickert. New molecular techniques have allowed Professor Shannon Weickert and her team to identify the presence of a fourth cell, the macrophage, a type of immune cell in the brain tissue of people with schizophrenia who show high levels of inflammation. Professor Shannon Weickert said immune cells have previously been ignored as they had long been viewed simply as travellers just thought to be passing by, undertaking surveillance work. They have never been a suspect until now. Finding immune cells along the blood brain barrier in increased amounts in people with schizophrenia is an exciting discovery. Professor Shannon Weickert said the findings suggested immune cells themselves may be producing these inflammatory signals in the brains of people living with schizophrenia. “We have observed in people with schizophrenia, the glial cells, one of the local residents, become inflamed and produce distress signals which change the status of the endothelial cells,” said Professor Shannon Weickert. The study published in Molecular Psychiatry has the potential to transform global schizophrenia research and open new avenues for developing targeted immune cell therapies.